Regency romance at its best. The opening chapter gave me tingles of delight as I realised that this regency romance was going to be as good as a Georgette Heyer. Humour is embedded in the story right from the beginning; first, through the letter from a dead man outlining his reasoning for wanting Henry to marry his daughter, and secondly, Henry himself, his younger brother Stacy and the rest of his eccentric family are hilarious. I enjoyed watching Henry stumble through a quick engagement to Florence only to ruin it all through jealousies, misunderstandings and general bickering. After some time apart, Florence decides that she will find someone else to marry and travels to London for the season. Henry has come to the conclusion that he loves Florence and sets out to court her. However, Florence is a popular lady and more than one young buck wants to win her affections. Not all of her suitors have good intentions towards her but Henry is more than able to scare away the competition and fight for the girl he wants to marry. Despite her youth, Florence and Henry make a great couple. Neither conform well to the conventions of society but Henry finds himself changing his rakish ways the more he gets to know Florence and by the end of the book he has transformed into a gentleman of marriageable quality. I loved Florence's character. She is determined, loyal, and has a strong sense of self worth. She doesn't cow down to Henry's domineering ways and forces him to rethink his attitudes. A delightful, charming book. I couldn't put it down. A writer to watch out for. I really hope this is only the beginning of a whole series of regency romances by Sophy Hester. 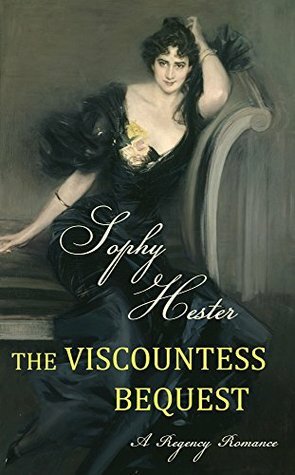 I kindly received a copy of The Viscountess Bequest from the author in exchange for my honest review. or read for free with Kindle Unlimited.